The following diagram illustrates a high level architectural diagram of the knowledge map. The business glossary defines all of the terminology used to described and categorize things of interest in the knowledge map. Think of this as reference or domain data organized into a thesaurus and taxonomies. The knowledge graph is the collection of all fact statements organized into simple "subject/predicate/object" collections of nodes and relationships. The knowledge graph is comprised of the "things" you care about organized and classified by the terminology defined in the business glossary. Much of the data in your knowledge graph will come from other systems in your organization as well as external systems. 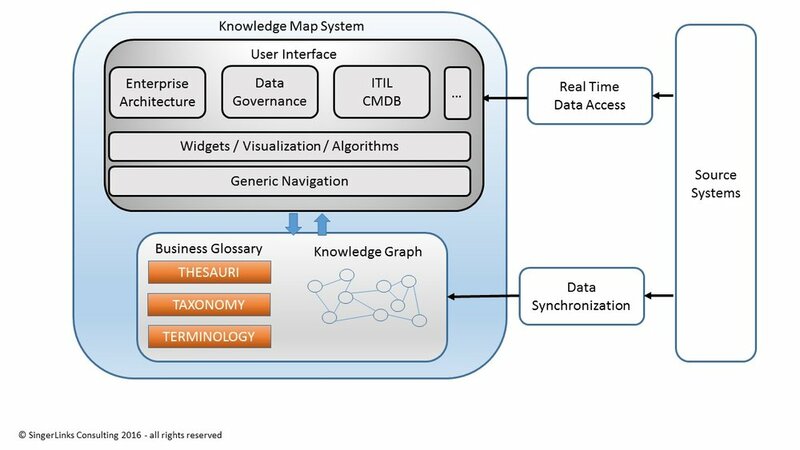 The main goal of the knowledge map is to connect data between all of the disparate silo'ed systems allowing individuals to rapidly navigate and locate desired information. A key design point is to determine how much data to collect in the knowledge map - the short answer is just enough to capture the key concepts and provide links between systems. More than just a UI, the knowledge map system harnesses the semantic awareness it has of the knowledge map to provide a situational awareness while navigating the data. Based on the users role in the organization and the data being currently viewed the system will show the user "smart answers" to high value data questions that have been defined in the system. Not all data from the source systems are replicated into the knowledge map - only enough to define key concepts and link to the concepts defined in other systems. Once a user has navigated to a section of the knowledge map, the system will automatically identify links to additional detail data obtained via web service or sql calls to the source systems.